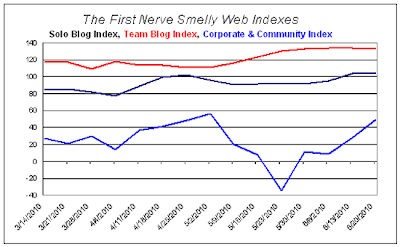 The Corporate & Community Site Index continued its recovery with impressive gains. OsMoz has now returned to levels not seen in three months. The Team Blog Index hardly budged. On the Solo Blog Index a couple of big gainers balanced out a couple of big losers. Avery, how are the stats complied? I had 25,000 visitors after the NYT story hit, all from about June 10 to June 17 or so. I went to one site and it showed I had 57 hits in May - ahem. Many times that per day, according to my statcounter. I guess you check on Alexa?